Coronary heart disease accounts for 18% of deaths in the United States every year. The disease results from a blockage of one or more arteries that supply blood to the heart muscle. This occurs as a result of a complex inflammatory condition called artherosclerosis, which leads to progressive buildup of fatty plaque near the surface of the arterial wall. In a paper published last month in the SIAM Journal on Applied Mathematics, authors Sean McGinty, Sean McKee, Roger Wadsworth, and Christopher McCormick devise a mathematical model to improve currently-employed treatments of coronary heart disease (CHD). The accumulation of plaque during CHD can result in chest pain, and ultimately, rupture of the artherosclerotic plaque, which causes blood clots blocking the artery and leading to heart attacks. A common method of treatment involves inserting a small metallic cage called a stent into the occluded artery to maintain blood flow. 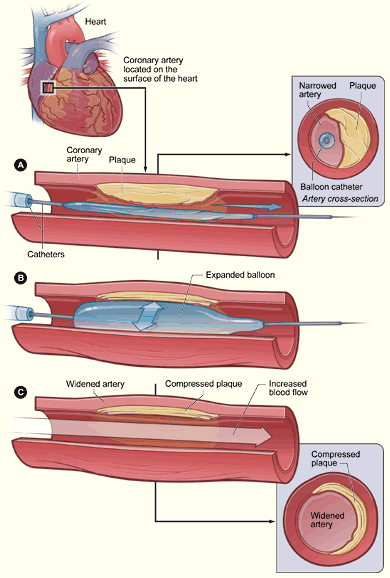 Cross-section of a coronary artery with plaque buildup: ‘A’ shows inserted deﬂated balloon catheter; balloon is inﬂated in ‘B’; ‘C’ shows widened artery. Source: National Heart, Lung, and Blood Institute; National Institutes of Health; U.S. Department of Health and Human Services. Image source: National Heart, Lung, and Blood Institute; National Institutes of Health; U.S. Department of Health and Human Services. However, upon insertion of a stent, the endothelium—the thin layer of cells that lines the inner surface of the artery—can be severely damaged. The inflammatory response triggered as a result of this damage leads to excessive proliferation and migration of smooth muscle cells (cells in the arterial wall that are involved in physiology and pathology) leading to re-blocking of the artery. This is an important limitation in the use of stents. One way to combat this has been the use of stents that release drugs to inhibit the smooth muscle cell proliferation, which causes the occlusion. However, these drug-eluting stents have been associated with incomplete healing of the artery. Studies are now being conducted to improve their performance. The model proposed by the authors considers a stent coated with a thin layer of polymer containing a drug, which is embedded in the arterial wall, and a porous region of smooth muscle cells embedded in an extracellular matrix. When the polymer region and the tissue region are considered as a coupled system, it can be shown under certain conditions that the drug release concentration satisfies a special kind of integral equation called the Volterra integral equation, which can be solved numerically. The drug concentration in the system is determined from the solution of this integral equation. This gives the mass of drug within cells, which is of primary interest to clinicians. The simple one-dimensional model proposed in the paper provides analytical solutions to this complex problem. “While the simplified one and two-dimensional models that our group and others have recently developed have provided qualitative results and useful insights into this problem, ultimately three-dimensional models which capture the full complex geometry of the stent and the arterial wall may be required,” McGinty says. SIAM Journal on Applied Mathematics, 73(6), 2004–2028. (Online publish date: November 12, 2013). The source article is available for free access at the link above March 9, 2014. This entry was posted in Biomedicine, Mathematics by SIAM. Bookmark the permalink.